None of them are particularly huge "OH ****" leads over one-another. I got what I wanted out of the Microsoft conference, I'm a biased Nintendo fanboy and Todd Howard is handsome fellow. Already gave thoughts on all but Nintendo, which was decent. It was clearly directed at people who are way more into Smash than me, though. Super Mario Party: It's literally 2 Switches glued together. Sony showcased 3 games where I said "oh **** I NEED this" and one that looked hella interesting, with some fun trailers between. Nintendo showcased the game I wanted them to do, announced FE and a fun-looking Mario Party, had some strong 3rd party games but didn't have anything to bring it over the edge. Microsoft just showed game after game and had the best flow of any presentation but didn't have an actual exclusive (I like Gears but not that much) to make me really wow me. As for 3rd parties, Bethesda wins even though I'm probably gonna skip Fallout 76. Rage looks fun, and new Doom and Wolfenstien stuff looks solid. Starfield and Elder Scrolls are exciting but probably at least two years away. Ubisoft was Ubisoft. EA had some games I liked but the presentation was bad. Square was just boring. Nintendo actually has some third party support. MS "won" in my eyes... if only because they showcased more games that I wanted. Except nothing that makes me think "Well I think it's time to cave and get an XB1 or an XB1X" - everything I saw made me think "Great! I can't wait until I get this for my PC/PS4/Switch". (Also Tales of Vesperia Definitive Edition baby!! Complete with the middle fingers to Microsoft intact!) Cyberpunk 2077 looks interesting, but it's probably a couple years away. There wasn't a floor demo, except for one that was behind closed doors. From what I have gathered, that means it's probably out of preproduction and what they got is only for investors so they can say "Hey, we're working on it." Bethesda's... Sure it's nice that we got ESVI but watch, it's going to be set in High Rock cause TES is mainstream and you all know the rule - humans and humans with minor proportion changes (and pointy ears) are the most important, and High Rock is easily teh most Stock. 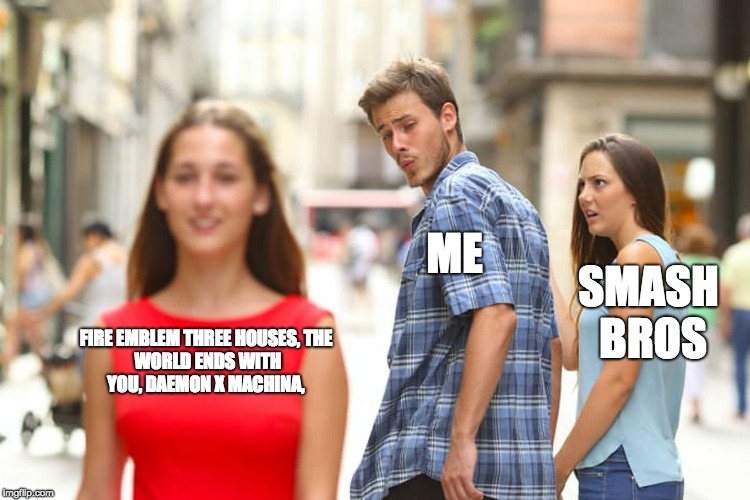 I WANT to be wrong - I'll settle for Hammerfell at least, but best case scenario is either Valenwood or Elsweyr. The Smash reveal along with the fact that Nintendo was the last to go is really what is putting their presentation so high up for me on my own list, along with Fire Emblem: Three Houses. Both of those titles are getting me excited for the future. I only missed Microsoft's, but it sounds like they had some amazing stuff at E3 this year. Sony's was short, and they spent like 30 minutes switching venues because they did some odd artsy stuff again this year lmfao. Decent presentation, though. I appreciated more stuff on Kingdom Hearts III and Death Stranding was so weird that I fell in love with it. Bethesda really knocked it out of the park with this one, I thought. They had a lot of really big IPs and games to show off. I think Fallout 76 is going to be a fun romp with friends even if it's online-only and really different. I'm glad Starfield was announced, too, and TESVI was such a pleasant surprise. It looked to me like it was Hammerfell, based on what I've seen in TESO, but it could also be Elsweyr. If I remember correctly, Elsweyr is like, a bunch of badlands. For some reason I find myself invested in Digital Devolver's weird story. PC Gaming Show was boring, and also NO BANNERLORD SCREEEEEEEEEEEEEEEE. EA was just insulting, solely because of the new Command and Conquer mobile title. What a slap in the face to C&C fans. Ubisoft was okay. The new Assassin's Creed looked interesting, but I'm probably not going to be getting it. Square was disappointing since we've seen most of the games that were shown already. Didn't feel like they had much new at all. Also, was kind of praying for a new Bravely Default title, only to have my dreams dashed on the rocks, so there's that. Bethesda really knocked it out of the park with this one, I thought. They had a lot of really big IPs and games to show off. I think Fallout 76 is going to be a fun romp with friends even if it's online-only and really different. I'm glad Starfield was announced, too. I'm super curious as to how a space RPG will look from the creators of Fallout and TES. Square is always disappointing me each year. Should come as no surprise. inb4 Starfield uses Gamebryo and all space ships are just hats that NPCs wear. I'm hoping Anthem isn't going to have that "Evolve" feel and flop after I throw 60 bones down the tubes. Also, CyberPunk has me hyped. I mean you can't just believe a studio is going to produce an equally successful and amazing game after spending the better part of the last decade on the witcher installments. But you really hope they do. Who knows maybe we'll have a Ciri cameo in it. She did mention she went to a place with flying cars and people with metal on their face. Is the Switch another Wii U? No third party support, and long software droughts. Looks like another Wii U to me. The Switch has third party support, but a lot of it is delayed ports which can be off-putting. I think it's clearly not a Wii U since the Switch outsold the Wii U all-time within one year. I mean, you've still got SEGA, Ubisoft, and various indies firmly enough in their corner but I think companies like EA, Square, Bethesda, etc. are still skeptical even if they're clearly interested. Microsoft had the best E3. Sony's E3 was bland at best, and while Nintendo got me really excited for Smash on the switch and the new Fire Emblem game, I feel like they really dropped the ball by not really even hinting at any of their other major titles being in development. Yeah, they said "Metroid 4 isn't ready to be shown yet" but then they shouldn't have announced it at all until this year, because it's Final Fantasy XV syndrome all over again - after waiting so long for a game to come out people just stop caring, and then there's literally no way it can meet expectations because people start to believe (perhaps incorrectly) that with as much time as was taken to create such a game it should be literally perfect, and it never is. I mean, maybe I'm just a naive Nintendo fanboy, but I wanted my Animal Crossing, I wanted SOMETHING about Metroid, I wanted Megaman to make a return appearance despite that they've all but given up on the series, idk. I just felt like, although they explicitly said they would be focusing on Smash, doing something like that just takes away the OOMPH from a presentation. Like, it's kind of lame to show up at something like E3 and be like "Yo here's one game have fun." New Mario Party looks sweet though, and so does Octopath Traveler. What about that Daemon X Machina game? Mecha are cool. My current ambition is to be to wield a giant mace and smash robots. I know its been said many times before but Nintendo doesn't prioritize E3 reveals as much as other companies do. They can do a Direct whenever they want, so they moreso use E3 as a chance to let people try the games and show extended play sessions on Treehouse. Their E3 presentations generally feel sparse compared to other companies but it balances out since they seem to announce stuff more often. I wanted Megaman to make a return appearance despite that they've all but given up on the series, idk. You HAVE seen the Mega Man 11 trailers right?